The dangerously thrilling Chadar trek involves walking on the frozen Zanskar River, camping in the icy wonderland of Ladakh, and discovering the dramatic beauty of a winter landscape, where the trees are bare and you are surrounded with ice, snow and cold. You'll see the bubbles trapped in the ice beneath your feet, stand in awe in front of tall waterfalls that are frozen in mid-fall, and in some cases, see the river flowing under the ice beneath your feet. These nine days will give you some of the most memorable experiences of your life. Chadar, in Hindi, translates to 'a blanket’. During winters, large sections of the Zanskar River freeze to resemble a blanket of ice, thereby naming the route as the Chadar trek. As heavy snowfall isolates a few desolate villages from the capital city, the trekking over the frozen Zanskar River remains the only way to reach these villages. Through much of the trek, steep canyons accompany you on either side. Sometimes, these canyon walls are the only support you'll have as attempt to make your way across fast-flowing, icy cold river water. • Embark on the Chadar trek to admire the raw, unfiltered beauty of the region. • Drive through the beautiful landscape of Ladakh to meet the Indus and Zanskar. 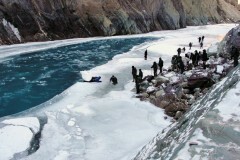 • Walk on the frozen Zanskar River flanked by canyons on both sides. • Spend the night under a frozen waterfall in the middle of a desolate icy landscape. Travellers are required to have prior experience of trekking to book this Chadar trek, since it requires enduring hours of trekking in chilly weather. Travellers are required to adhere to instructions of the trek leader during the trip. Arrive at Leh and check-in to a pre-arranged hotel. After a short briefing session with the trek leader, you'll spend the rest of the day at leisure. Don't exert yourself too much, since your body needs the rest to acclimatize to the high altitude. Your adjustment to the altitude makes all the difference to your trekking experience. A short walk around the local marketplace in the evening is a good idea. Overnight at Leh in hotel rooms. Continue the acclimitaztion process and take another day to rest and recover. Take short walks, keep yourself hydrated and have frequent meals. You'll also visit a hospital at Leh to get a medical check-up and obtain a health certificate, declaring you health to attempt the Chadar trek. Overnight at Leh in hotel rooms. Begin the day with a drive through the rugged wilderness of Leh towards Chilling. From the confluence of the Indus and Zanskar Rivers, at Nimoo, you'll follow the course of the Zanskar to reach Tilad Do. Here, you'll take your first steps on the cold icy terrain of the frozen river and reach your campsite at Tsomo Paldar, where you'll halt for the day at a campsite located on higher ground. Overnight at Tsomo Paldar in tents. Trek alongside the flowing, deep blue water of the river. Start the day early and begin trekking towards Tibb Cave. The route for this section of the Chadar trek passes through deep gorges with rocky walls, not allowing for a lot of sunlight even during day time. You'll trek over a fairly solid sheet of ice, but expect to slip and glide across multiple times. Your destination, the Tibb Cave, is generally used by local villagers as shelter during the night. Overnight at Tibb Cave in tents. Walk on a thick sheet of ice layered over the Zanskar River. One of the longer days of the trek, your trek to Naerak with take about 8 hours of walking over the river. By now, you're already comfortable with walking on ice and snow, allowing you to trek faster while focusing on the stunning landscapes around you. The trail today takes you past the iconic frozen waterfall of Naerak, where you'll see prayer flags fluttering in the distance. Overnight at Nyerak in tents. Rocky mountains of Ladakh imposing on the horizon. Nyerak is the farthest point on this itinerary. Today, you'll begin retracing your steps back to Leh. However, the Chadar is a living breathing entity, and it changes every day. The ice melts and forms new patterns; the snow covers landmarks that were previously wide open, and the sky changes with the hour of the day. You might not recognize the same route you walked over just two days ago. Overnight at Tibb Cave in tents. Glimpse breathtaking views from vantage points. Begin trekking to Gyalpo. En route, you might spot a few local villagers, traditionally dressed in Gonchas, or monks returning from the Lingshed Monastery. Well adapted to trekking on the thick ice sheet, you'll enjoy gliding on smoother terrain. Your campsite at Gyalpo is set on a bend of the Zanskar River with soaring gorges around you. Overnight at Gyalpo in tents. Stick to the thicker sections of the ice while walking. On the last day of the trek, you'll begin walking back towards Tilad Do. 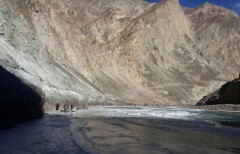 At the end of your trek, you'll cross the Zanskar River and head towards the vehicles waiting for you. You'll be driven back to Leh. A hot bath, warm rooms, comfortable beds, and a delicious dinner awaits you at Leh. Overnight at Leh in hotel rooms. Walk in sub-zero temperatures to views of a frozen landscape. Check out of the hotel in the morning. Your trip ends here. Overnight at Leh in hotel rooms. You'll be accommodated in hotel rooms on triple-sharing basis. Since no meals are included in today's package, you'll need to spend extra to have meals at any of the local restaurants at Leh. You'll be accommodated at a campsite near today's destination in tents on triple-sharing basis. The tents will be equipped with sleeping bags and mattresses. Today's meal package includes meals of lunch and dinner only. However, at an additional cost, you may have breakfast at the hotel before beginning the trek. Barren, brown gorges and canyons raising high above you. You'll be accommodated at a campsite near today's destination in tents on triple-sharing basis. The tents will be equipped with sleeping bags and mattresses. Today's meal package includes meals of breakfast, lunch and dinner. Small pieces of ice flowing over the river water. Explore the snow-swept, winter paradise of Ladakh. You'll be accommodated in hotel rooms on triple-sharing basis. Today's meal package includes meals of breakfast only. However, at an additional cost, you may have extra meals at any of the restaurants at Leh. Crystals of ice hanging from the sky at a frozen waterfall. Since no meals are included in today's package, you'll need to spend extra to have meals at any of the local restaurants at Leh. Your trip ends here. The operator will arrange your travel to the start point of the trek.